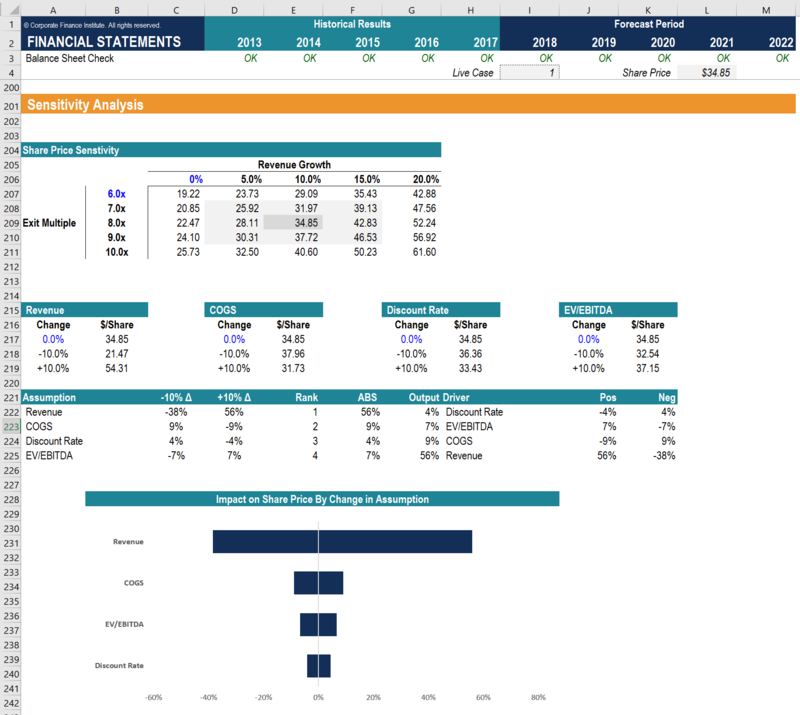 A financial model is simply a tool that’s built in Excel to forecast a business’ financial performance into the future. 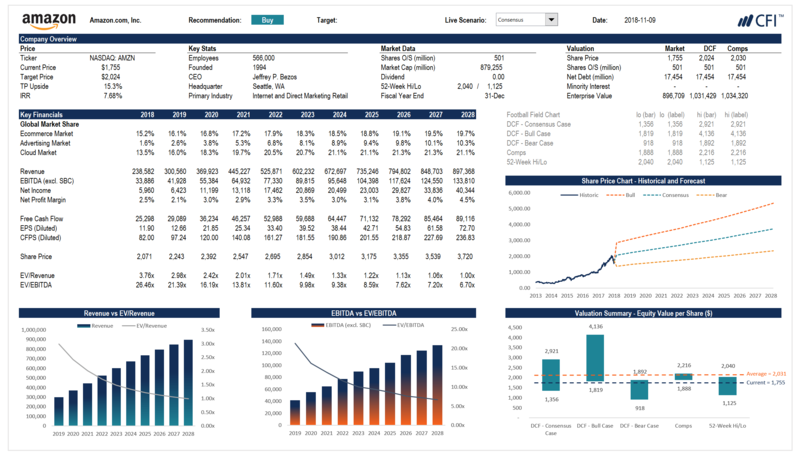 The forecast is typically based on the company’s historical performance, assumptions about the future, and requires preparing an income statement, balance sheet, cash flow statement and supporting schedules (known as a 3 statement model3 Statement ModelA 3 statement model links the income statement, balance sheet, and cash flow statement into one dynamically connected financial model. 3 statement models are the foundation for advanced financial models such as DCF models, merger models, LBO models, and others. This three statement model guide has examples, images). From there, more advanced types of modelsTypes of Financial ModelsThe most common types of financial models include: 3 statement model, DCF model, M&A model, LBO model, budget model. Discover the top 10 types of Excel models in this detailed guide, including images and examples of each. Financial modeling is performed for many reasons including to value a business, raise money can be built such as discounted cash flow analysis (DCF model), leveraged-buyout (LBO), mergers and acquisitions (M&A), and sensitivity analysis. 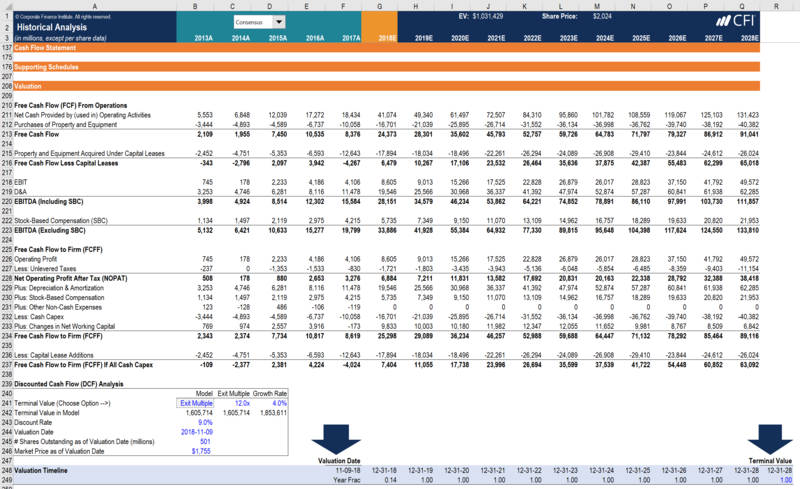 Below is an example of financial modeling in Excel. There are many different types of professionals that build financial models. The most common types of career tracks are investment bankingHow to get a job in investment bankingThis guide will outline how to get a job in investment banking using out top three tactics: networking and resume, interview prep, and technical skills. This guide is based on my firsthand experience of what is the most effective way of how to get a job in investment banking., equity research, corporate development, FP&A, and accounting (due diligence, transaction advisory, valuations, etc). To learn more about jobs and careers that require building financial models, explore our interactive career map. How can you learn financial modeling? The best way to learn financial modeling is to practice. It takes years of experience to become an expert at building a financial model and you really have to learn by doing. Reading equity research reports can be a helpful way to practice, as it gives you something to compare your results to. One of the best ways to practice is to take a mature company’s historical financials, build a flat-line model into the future, and calculate the net present value per share. This should compare closely to the current share price, or the target prices of equity research reports. It’s also important to establish a solid base understanding by taking professional financial modeling training courses such as ours offered at CFI, with many locations Financial Modeling Course Torontoacross North America. In the meantime, you may also be interested in having a go at building your own financial models. Feel free to use our available free templates to get a jump start before taking one of our courses. Ensure you know how to use the most important Excel formulas and functionsExcel Formulas Cheat SheetCFI's Excel formulas cheat sheet will give you all the most important formulas to perform financial analysis and modeling in Excel spreadsheets. If you want to become a master of Excel financial analysis and an expert on building financial models then you've come to the right place. It’s important to clearly distinguish between inputs (assumptions) in a financial model, and output (calculations). This is typically achieved through formatting conventions, such as making inputs blue and formulas black. You can also use other conventions like shading cells or using borders. Below is a step-by-step breakdown of where you should start and how to eventually connect all the dots. For much more detailed instruction, and to work through your own Excel model, check out our financial modeling courses. Every financial model starts with a company’s historical results. You begin building the financial model by pulling three years of financial statements and inputting them into Excel. Next, you reverse engineer the assumptions for the historical period by calculating things like revenue growth rate, gross margins, variable costs, fixed costs, AP days, inventory days, and AP days, to name a few. From there you can fill in the assumptions for the forecast period as hard-codes. With the forecast assumptions in place, you can calculate the top of the income statement with revenue, COGS, gross profit, and operating expenses down to EBITDAEBITDAEBITDA or Earnings Before Interest, Tax, Depreciation, Amortization is a company's profits before any of these net deductions are made. EBITDA focuses on the operating decisions of a business because it looks at the business’ profitability from core operations before the impact of capital structure. Formula, examples. You will have to wait to calculate depreciation, amortization, interest, and taxes. With the top of the income statement in place, you can start to fill in the balance sheet. Begin by calculating accounts receivable and inventory, which are both functions of revenue and COGSAccountingOur Accounting guides and resources are designed as self-study guides to learn accounting and finance at your own pace. Browse hundreds of articles on important topics such as the income statement, balance sheet, cash flow statement, depreciation methods, how to link the 3 statements, debits & credits, journal entries as well as the AR days and inventory days assumptions. Next, fill in accounts payable which is a function of COGS and AP days. Before completing the income statement and balance sheet you have to create a schedule for capital assets like Property, Plant & Equipment (PP&EPP&E (Property, Plant and Equipment)PP&E (Property, Plant, and Equipment) is one of the core non-current assets found on the balance sheet. PP&E is impacted by Capex, Depreciation and Acquisitions/Dispositions of fixed assets. These assets play a key part in the financial planning and analysis of a company’s operations and future expenditures) as well as for debt and interest. The PP&E schedule will pull from the historical period and add capital expenditures and subtract depreciation. The debt schedule will also pull from the historical period and add increases in debt and subtract repayments. Interest will be based on the average debt balance. The information from the supporting schedules completes the income statement and balance sheet. 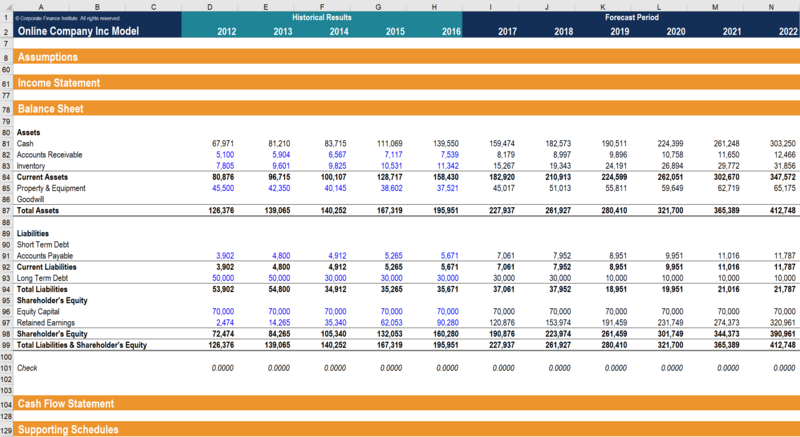 On the income statementIncome Statement TemplateFree Income Statement template to download. 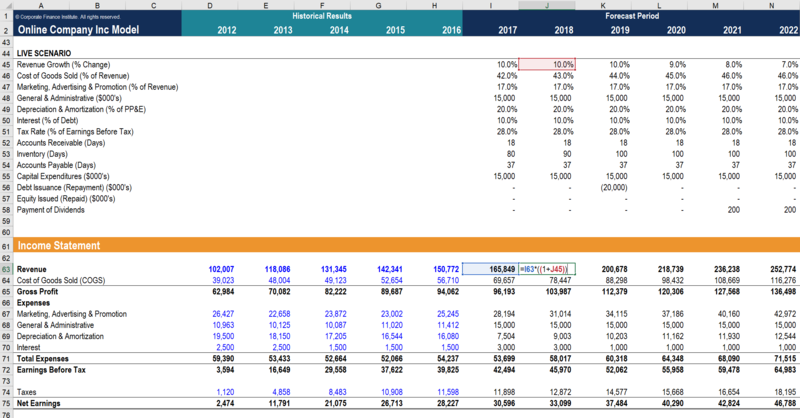 Create your own statement of profit and loss with annual and monthly templates in the Excel file provided. The file includes revenue, cost of goods sold, gross profit, marketing, selling, G&A, salaries, wages, interest expense, depreciation, amortization, taxes, net income, link depreciation to the PP&E schedule and interest to the debt schedule. From there you can calculate earnings before tax, taxes and net income. On the balance sheet link the closing PP&E balance and closing debt balance from the schedules. Shareholder’s equity can be completed by pulling forward last year’s closing balance, adding net income and capital raised and subtracting dividends or shares repurchased. With the income statement and balance sheet complete, you can build the cash flow statement with the reconciliation method. Start with net income, add back depreciation and adjust for changes in non-cash working capital, which results in cash from operations. Cash used in investing is a function of capital expenditures in the PP&E schedule and cash from financing is a function of the assumptions that were laid out about raising debt and equity. When the three statement model is completed it’s time to calculate free cash flow and perform the business valuation. The free cash flow of the business is discounted back to today at the firm’s cost of capital (its opportunity cost, or required rate of return). We offer a full suite of courses that teach all of the above steps with examples, templates, and step-by-step instruction. Read more about how to build a DCF modelDCF Model Training Free GuideA DCF model is a specific type of financial model used to value a business. DCF stands for Discounted Cash Flow, so the model is simply a forecast of a company’s unlevered free cash flow discounted back to today’s value. This free DCF model training guide will teach you the basics, step by step with examples and images. Once the DCF analysis and valuation sections are complete, it’s time to incorporate sensitivity analysis and scenarios into the model. The point of this analysis is to determine how much the value of the company (or some other metric) will be impacted by changes in underlying assumptions. This is very useful for assessing the risk of an investment or for business planning purposes (i.e. does the company need to raise money if sales volume drops by x percent?). Clear communication of results is something that really separates good from great financial analysts. The most effective way to show the results of a financial model are thought charts and graphs, which we cover in detail in our advanced Excel course, as well as many of the individual financial modeling courses. Most executives don’t have the time or patience to look at the inner workings of the model, so charts are much more effective. When the model is done your work is not over. Next, it’s time to start stress testing extreme scenarios to see if the model behaves as expected. It’s also important to use the auditing tools covered in our financial modeling fundamentals course to make sure it’s accurate and the Excel formulas are all working properly. Want to see all the above steps in action? Check our CFI’s free webinar video about how to build a 3 statement financial model in Excel in scratch. This live demonstration will show steps 1 – 6 listed above. Steps 7 – 10 are covered in more advanced financial modeling classes. We hope this has been a helpful guide on what financial modeling is all about and how to perform it. 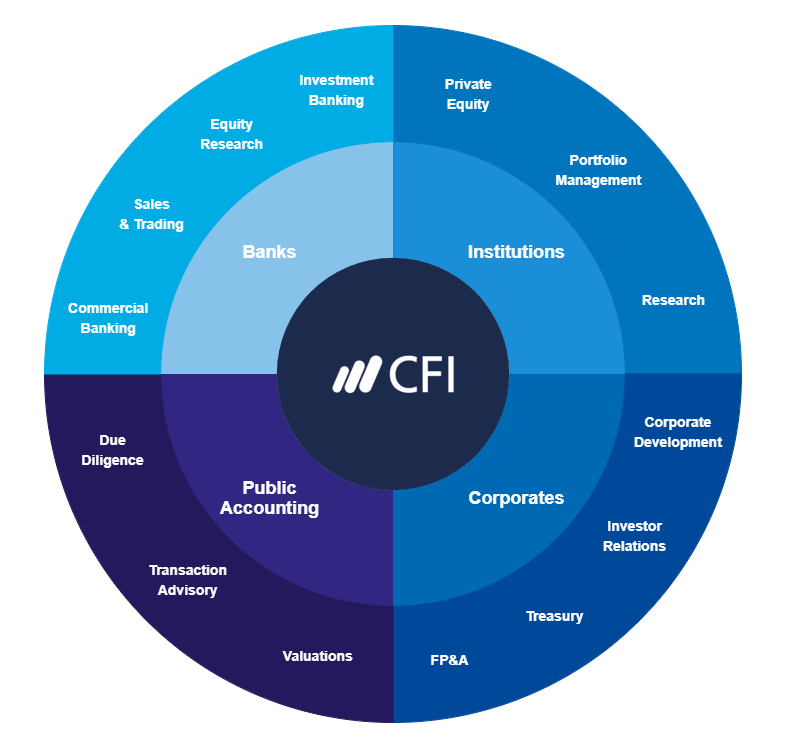 CFI is the official global provider of the Financial Modeling and Valuation Analyst (FMVA)® designation.